The representation of geospatial data with the goal of understanding how data evolves through time in specific regions is an important task for retail companies. 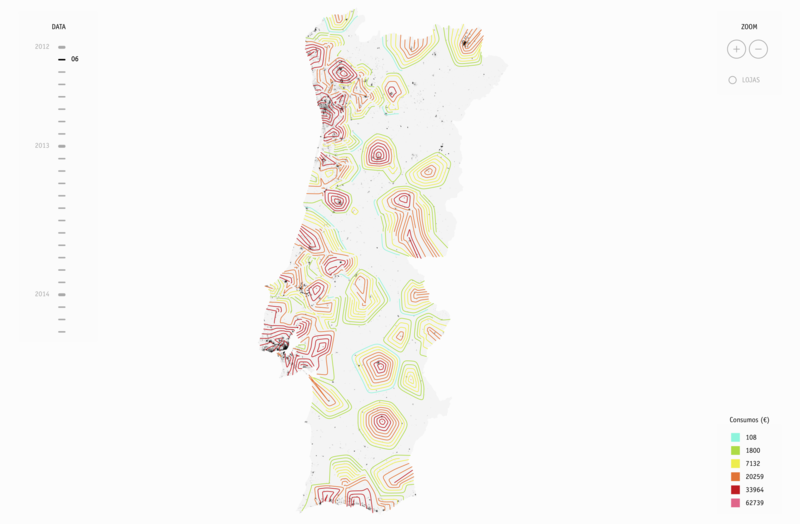 The main goal for this project is to apply an Information Visualization technique to represent how consumptions are distributed throughout Portugal and how this distribution evolves over time, highlighting the changes in the patterns of consumption in specific times of the year, such as Christmas. 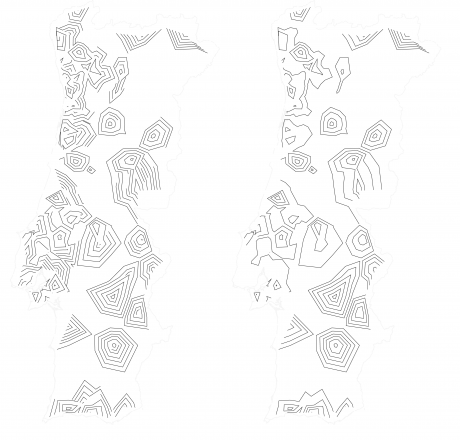 To represent the geographical variations of consumptions, and as an initial approach, we resort to contour lines, i.e. isolines, which delineate areas with similar values of consumption, identifying regions with different consumptions. Isolines depict consumptions that were not measured in those specific geographical points, but that were calculated in relation to the area of collection. The use of isolines allows us to identify, delimit, and highlight geographic areas of high and low consumption values. The consumptions data is retrieved from 729 Portuguese supermarkets and hypermarkets of the SONAE chains, which covers the entire country. For this project we used all the transactions made on those supermarkets and hypermarkets from May 2012 to April 2014. Each transaction corresponds to one product bought and it has properties such as price, date, place, and time of purchase. We aggregate all the purchases independently of the type of product. Since the goal of the project is to give an overview of the consumptions differences among the months of our dataset, we also calculated the average consumption value for every month, depending on the municipal district where the purchases occurred. To differentiate the areas with different consumptions we draw a set of lines to separate them: isolines. Each one of these lines, is representative of one consumption value and separates the areas with more and less consumptions than the lines’ value. The isolines are projected on the Portuguese map along with the representation of the main buildings (retrieved from the Open Street Maps) and the zip codes of costumers. This data provides a visual reference to the viewer, highlighting on the map the main residential conglomerates and buildings. These locations are represented in the map with small, black circles of equal size so they do not overpower the visualization but, at the same time, are visible and can be compared with the consumption data. To generate the isolines, first we had to create a triangulation between the centroids of all municipal districts of Portugal. We used the Delaunay Triangulation algorithm to do so (Lee and Schachter, 1980). To avoid cluttering and promote readability, the isolines have a similar distance among them. Considering that we want our isolines to be evenly distributed, the isolines’ values cannot be predefined. As such, we defined a minimum distance and represented only the isolines that have that minimum distance among them. With this first approach, the resulting isolines were too sparse, which translated into a small amount of information, difficulting the reading of the data. Differences of the visualization with iso-edges (left) and without (right). 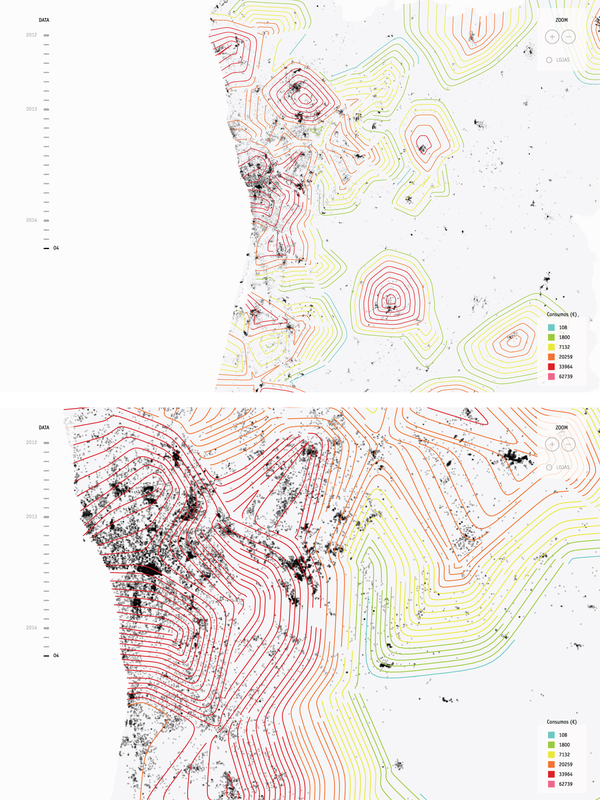 One can perceive that in the left side of Portugal, specially in the center and upper part, the iso-edges generate more density, thus creating more insight about the consumptions..
To give more insight, we decided to complement the isolines. As such, in addition to the previously drawn isolines, we also draw isolines which are not closed—iso-edges. These iso-edges, are calculated in the same way as the isolines, but, if the isoline has segments which are too close from the previous drawn isolines, those edges are eliminated until the isoline is drawable. 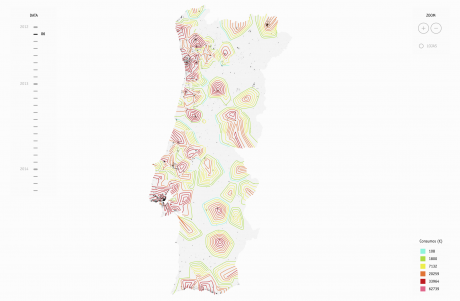 This technique resulted in a wide number of iso-edges, which completed the visualization and gave more insight about the data, specially in cluttered areas created by municipal districts which are too close to each other. Visualization of the consumptions in December 2012 (left) and January 2013 (right). Between these two months, the average consumption is similar, having higher differences in the center of Portugal, higher consumptions in December than in January. To facilitate the interaction and exploration of the visualization, we developed a intuitive interface which allows the user to explore the map and to change the displayed time period. To change the month, the user has a slider on the right side of the interface. This slider allows the user to choose between the different months simply by clicking on the intended month. The user can also interact with the map by zooming, using the buttons in the right upper corner or by using the scroll of the mouse. The zoom has different levels in which the isolines and iso-edges are updated. As the user zooms in, more isolines and iso-edges appear creating a more detailed map of the consumptions in the zoomed area. The user can also drag the map and explore different areas of Portugal. C. Maçãs, P. Cruz, E. Polisciuc, H. Amaro, and P. Machado, “Iso-edges for the Geovisualization of Consumptions,” in IVAPP 2016 – Proceedings of the 11th Joint Conference on Computer Vision, Imaging and Computer Graphics Theory and Applications, 2016, pp. 220-227.